It’s taken me awhile to write about this because I wasn’t totally sure what to say. I know what I would say if I saw you in person but writing this down is harder. Tuscobia was riddled with a string of misfortunate events but I don’t believe any of those things led to my DNF. I honestly truly believe I never wanted to do it in the first place. 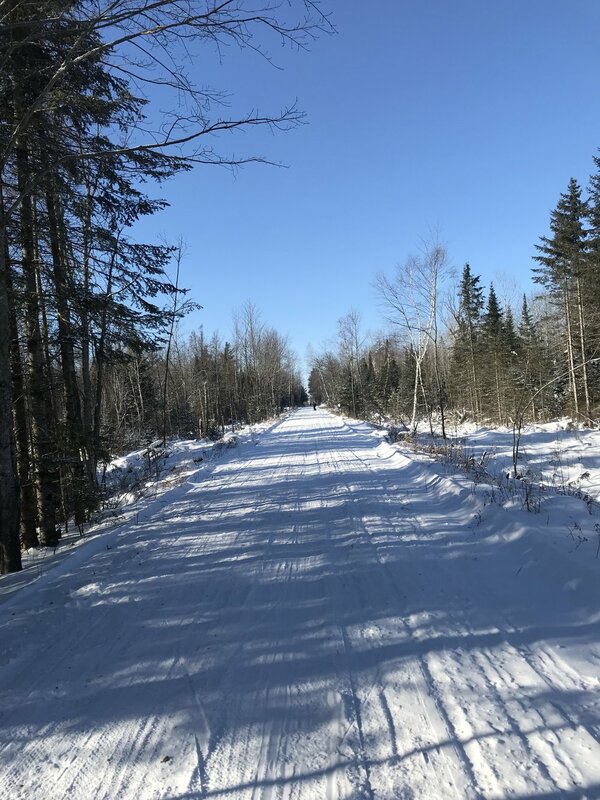 So Tuscobia race report. It started back in August when the 80 mile race sold out in less than a week. I figured it was no big deal since I didn’t even want to do it to begin with. But I love the winter crazies and I wanted to go back and see them. So I put my name on the waitlist. It wasn’t till November that I actually got in. This is when I had to ask myself. Do you actually want to do this race and are doing this for the right reason? In my head I said sure. I am capable of doing this and it would be good training for Alaska. Plus I wanted to see my friends again. Though in all honesty non of those are good enough reasons. Life added some rollercoasters in the fall and my desire to go to the Tuscobia kept getting smaller and smaller. I remember messaging my friend Kummer and saying I wanted to stay in Bozeman for New Years because it would give me a greater chance to be social and possibly meet some new men. But after saying that out loud I knew how stupid that was. Tuscobia with the winter crazies was exactly where I wanted to be on New Years and I new that. So the race was a go. I flew into Ohio a few days before hand to see my pregnant sister. Then my friend Lester who was driving up from South Carolina picked me up on the way. We would have a 10hr drive together to get to the race. I drive a lot and mostly alone so a 10hr drive didn’t sound like much to me. My sister dropped me off with Lester in the morning and we were headed towards Rice Lake, WI. That was until the truck slowed to 40 mph. It was throwing some warning codes on the dash so I quickly read through the manual. It looks like the diesel fuel might be jelling I read. He had last filled up in Kentucky which wouldn’t treat there fuel for -10F so it was a possible idea. We pulled over and added some mixture to the fuel. Back on the interstate for another few miles and it was back down to 30 mph. This game of pull over drive slow pull over drive slow went on all the way to Indianapolis were after 4hrs and only traveling 100 miles we pulled into a Ford dealership. 3 more hours later and we had a fixed truck. Apparently the fuel filters Lester got changed in SC were cranked too tight and broke the fuel pump. This was allowing air to get sucked into the pump and thus loose engine power. Whatever the issue was didn’t matter at this point. The truck was fixed and we still had over 8hrs to drive to get to the race. Lester finally able to breath after a stressful morning stopped at a local Wendys to get a burger for the road. The lady at the counter took his 5 dollar bill held it up to the light a few times and then gave him his change. I chuckled a bit at the idea of someone questioning the realness of a 5 dollar bill. But we were finally moving so spirits were high. That was till we hit Chicago. The set back with the broken truck sent us straight through Chicago during rush hour. We sat in bumper to bumper traffic for hours, with incredibly icy and slick roads, that led us straight to toll road central. The drive through Chicago added at least another hour if not more to our already close to 18hr day now. Needless to say Lester and I were both silent and unhappy. We stopped around 10pm to grab some dinner and I would take over the final 4hr push into Rice Lake. The windshield wipers didn’t work and the windshield immediately upon driving became covered in salt and road gunk. I spent the next 4hrs into the early morning head forward trying to look through a tiny bit of windshield that was barely visible through. The next morning we woke up and were just happy to actually be at the race. Against a lot of odds we actually made it. We headed into the nice town of Rice Lake and grabbed a quick breakfast with our good friend Scott Kummer. The usual pre race grocery store runs and then it was gear check time. Lester and I loaded up to the race head quarters with our required gear. 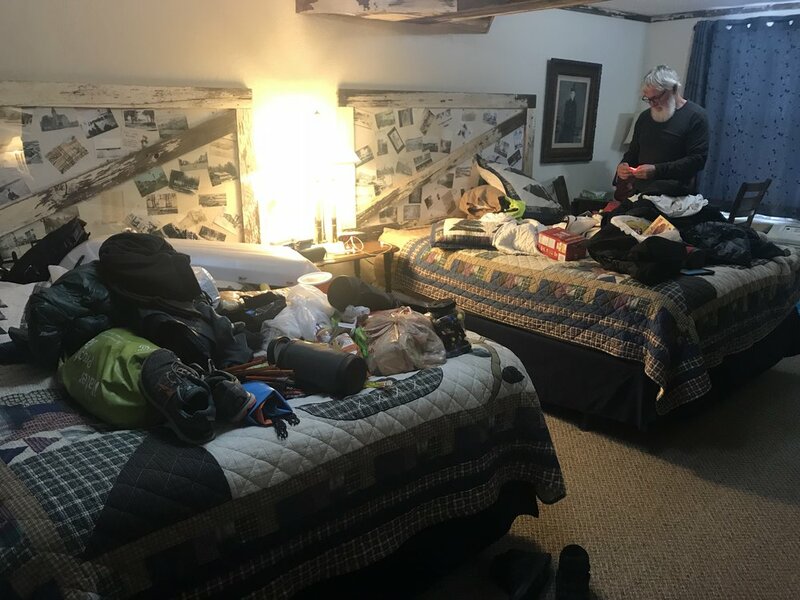 I breezed through gear check while Lester got caught up with a sleeping bag issue. A few hours later and we were both cleared to race. We headed back to the hotel to get situated. The sleeping bag issue had put Lester in a bad mood and I was feeling anxious about the race. This is when I sliced open my knuckle. I felt so stupid the dull knife went forcibly right over my joint. I ran to the front desk and get some first aid on it quickly. After a quick call to my sister it wasn’t deep enough to warrant an emergency run. It did however feel like the final straw. We returned to the race start for a prerace debriefing. I got to see a couple more friends from over the years of racing and the sinking feeling continued to set in. I didn’t want to do this. I didn’t want to do this so bad that I didn’t even want to start it. I’d rather work the aid station all day and get to help my friends succeed then even set one foot on the course. Lester went into the hotel room after the prerace and I stayed in the car to make a few phone calls. I talked on the phone with a few friends repeating that I wasn’t planning to start the race. I was talked down a bit and decided I would at the very least start the race. Though I knew I wasn’t making it to the finish. The first opportunity I had to bail I was taking it. Lester and I drove to the race start with our friend Scott. By the time the race started I was already unable to feel my toes. I was layered very lightly even though it was currently -12F. I had to run at the beginning because I was afraid I was going to loose my toes. I kept running and running checking in periodically to see if I had regained blood flow. It maybe took me 5 miles before I was able to breath comfortably again. The toes had finally regained feeling. All the running however had caused me to sweat and I could feel a layer of ice had built on the inside of my jacket. I had made a plan to keep moving until an hour before sunset. Then to find a sunny place to layer up and put hand warmers in my gloves. I made it to the first town 20 miles in faster than expected. I must have been in 3rd or 4th place at that point since I had run so much in the beginning. A few other men were doing things in there sled so I decided it was fine for me to as well. I took off my jacket and watched the ice fall on to the ground. I hadn’t realized how bad that had become. I then tried to add my fleece layer. It must have only been about 30 seconds with my warm mittens off that my fingers started to loose dexterity. I reached in a panic for my hand warmers as the pain started to become extreme. Unable to open the hand warms with the current functionality of my fingers. I shoved my hands in my mittens anyways. Next came the extreme audible moaning the pain was so intense I was going to loose my fingers I couldn’t feel them. I couldn’t just stand there freezing jacket less in -20F in the setting sun. I yelled at a person in a car is the bar open is THE BAR OPEN!!??? It was only about 2:30pm but the bar had opened when a few bikers came barging in looking for warmth. I was the first runner they had seen and I ran as fast as I could sled open because I couldn’t zip it shut with my brick hands. I blasted into the bar crying in pain. 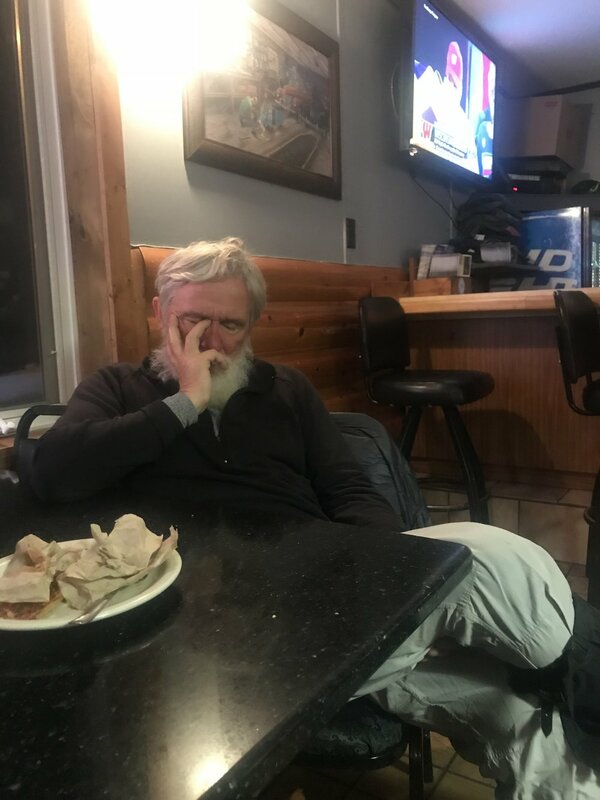 A few bikers were sitting at the bar and I went straight to the bathroom to run some room temperature water over my fingers. My fingers were already discolored and I was still unable to feel them. The water didn’t help and I frantically came back into the bar repeating I can’t feel my hands I can’t feel my hands. I sat over a heat vent for a few minutes massaging them but the feeling refused to come back. I sat down at the bar and a biker bought me a drink. My fingers had entered a tingling phase so I was thankful they would still have some sort of feeling. The bikers at the bar were DNFing and though the plan was to DNF at the half way point I didn’t see any reason why DNFing now versus then made any difference. I hung out for a while with them at the bar before Lester came in. Lester proclaimed girl I’ve been trying to catch you for hours! I laughed and said well here I am. He wanted me to walk with him to the half way point but I was done. I didn’t want to do hard things for the sake of them being hard. I didn’t want to suffer for the sake of suffering. I gave it a 20 mile go but I was over it. I loaded up with the bikers as Lester headed on. They took me to the aid station were I got to help other runners continue on or DNF. I had so much fun talk to people, hanging out, and drying clothing. Not for a second did I wish I had continued to march in the ridiculous cold. Plus how often do you get to take a ride in Randys mini van!? Next came the call from Lester. He was at a bar in Winter about 10 miles from where I had last seen him at the other bar. He wanted me to come and get him he was done. I hoped in the truck and drove over to the bar. It was packed full of snowmobilers who thought we were the craziest specimens alive. Thus they bought me a few shots and then Lester and I insisted we had to go. So we drove back to the aid station to find our friend Scott arriving. Scott had contracted some sort of cold but was in great shape. He made a deal with us that he would DNF only if we all went to a bar together. Thus the three of us loaded up and I hit my 3rd bar the night. I couldn’t think of a more fun way to spend my time at the Tuscobia than bar hoping my way across Northern Wisconsin. Lester and I said our goodbyes to Scott in the morning and we started our long 10hr drive back to Ohio. It went faster this time with no car troubles and taking an alternate route to avoid Chicago. My pregnant sister was super sick but she was happy to get to see me for a few extra days. We took a short ice skating trip in downtown and then I returned back to Bozeman. So what have I concluded from another midwestern DNF? Success rate in the midwest is 0 for 2. I guess in math terms I'd put it this way. X is a very hard thing. Y is just hard. X appeals to me so I go and do it. By doing X this means I can do Y because X is harder than Y. Y does not appeal to me but via this algorithm I am capable of doing it so I go and do it. I fail at Y. By failing at Y does this mean I cannot do X because X is harder than Y but I couldn’t do Y? That can't be true because I already did X. So it must mean that Y is harder for me personally because I didn't have the desire to do it though people may perceive X as harder. So to bring this back to Tuscobia. I am very physically capable of running the Tuscobia. I am however not at all mentally capable of doing it. It is brutally cold and boring. And most of all I don’t want to do it. 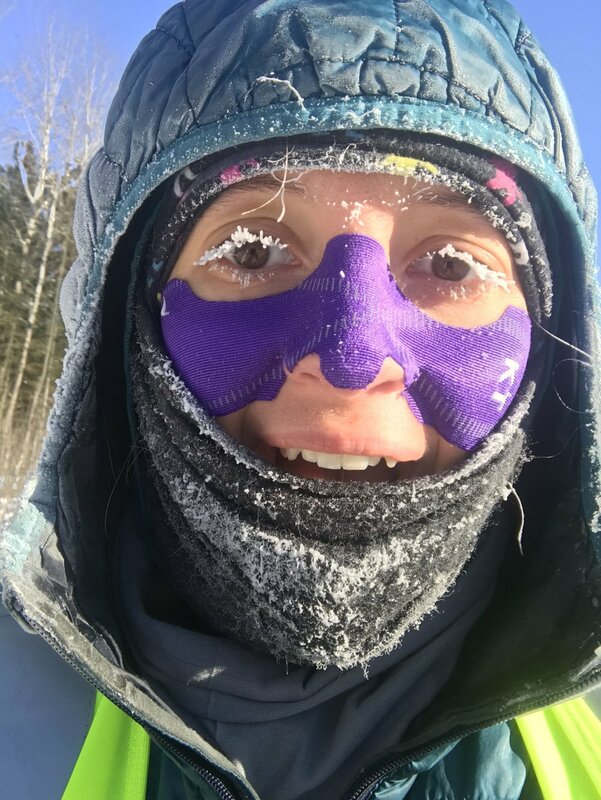 I think running in -20F in the flat boring nothingness of Northern Wisconsin is the most miserable thing in the world, and when I was out there I had the ability to change that misery so I did. And I’ve come to realize that being miserable is the worst thing ever and we should try and limit the misery as much as possible so that when we have misery that we can’t control, like unexpected health complications, we can handle them and say THANK GOD I DIDN’T SUFFER MORE THAN I NEEDED TO WHEN I WAS HEALTHY!